SANTA MONICA, Calif. (September 20, 2018) – Congressman Ted Lieu paid a visit to Santa Monica today to draw attention to the importance of travel to the state’s economy and celebrate California’s new official sport – surfing. At a roundtable event held at Shutters on the Beach Hotel, the Congressman heard from travel advocates and businesses directly and indirectly impacted by travel. Travel is one of the largest industries in the United States, employing more than 14 million Americans. In California alone, close to one million people are directly employed by the travel industry. Members of the SMTT Board of Directors and other regional travel stakeholders joined Congressman Lieu at the roundtable hosted by the U.S. Travel Association, the national organization that leverages the collective strength of those who benefit from travel to grow their business beyond what they can do individually. The meeting highlighted policies the state’s Congressional delegation can support in Washington to encourage travel, welcome more visitors, and generate economic activity at the local level. Following the roundtable, the Congressman stepped onto Santa Monica State Beach to celebrate the first-ever ‘California Surfing Day’ with local surfers including Jessi Miley-Dyer, Women’s Commissioner for World Surf League and Chef Raphael Lunetta of twin restaurants ‘Lunetta All Day’ and ‘Lunetta At Night.’ Eddie Mack, Global Messenger for Special Olympics Southern California also attended to join in the festivities to celebrate Santa Monica, the location of the organization’s first international games in 1972. Last month, California declared surfing its official state sport and designated Sept. 20 as an official holiday to celebrate the Golden State’s surfing lifestyle, and honor the history, culture, and future of the sport. With the ocean as a playground, it’s no surprise that Santa Monica has a rich surf culture. Year-round warm weather, the 3.5 mile stretch of coastline, and a wide selection of surf schools make it an ideal location to learn how to ride a wave. Providing excellent conditions for beginners, Santa Monica’s sand bottom beaches receive rolling waves from the Pacific all year long, making it one of the most consistent surfing destinations in Southern California. 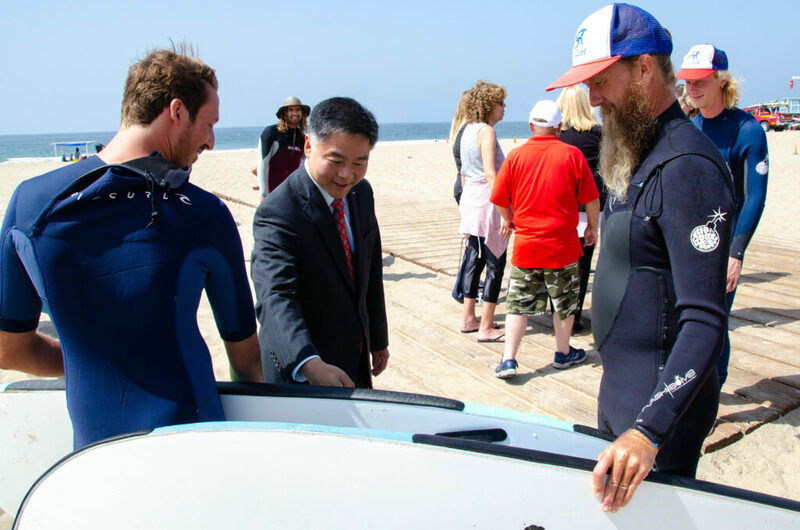 Following Congressman Lieu’s departure, Eddie hit the waves with instructors from Aqua Surf, a Santa Monica-based surf school that works to educate, inspire, lead, and empower people to a greater sense of awareness, knowledge, health, and eco-responsibility through surfing.